We liked Quadropolis enough to give it four stars. Each of those was ripped down from the front of a nearby observatory as it was demolished to make way for a new power plant. 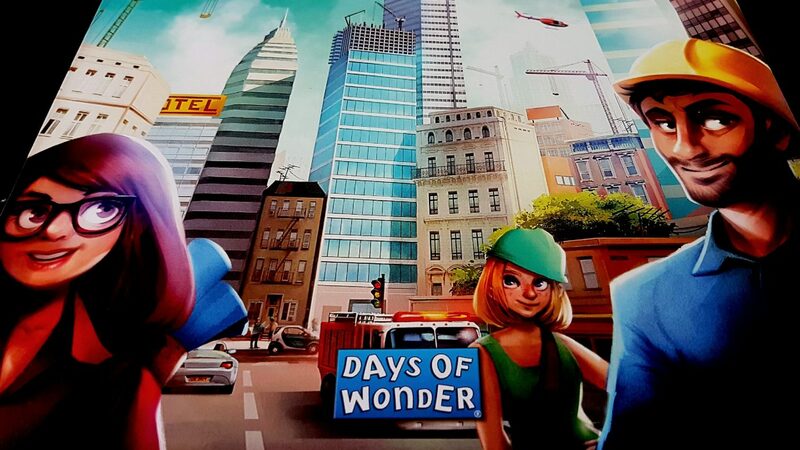 It’s a good game – a clever game – and it’s well worth your time even if you have other city builder games sitting on your shelves. It’s fun, but that’s not enough for us – we also need to determine if that fun is actually available to everyone. 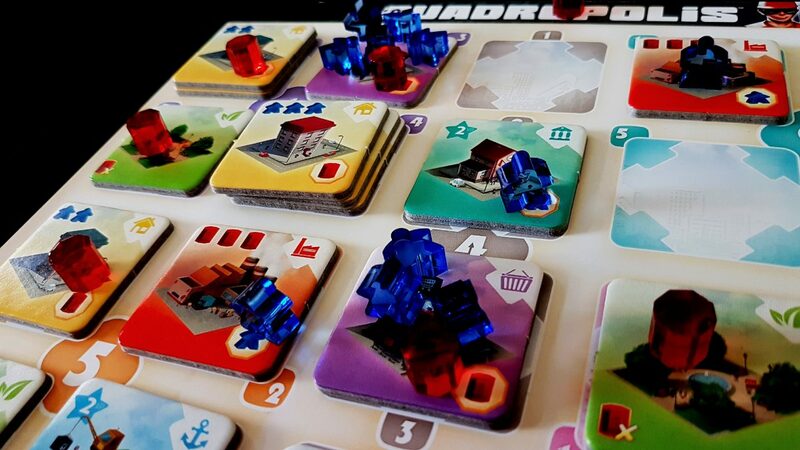 Cities need to be accessible spaces – let’s find out if Quadropolis honours that expectation. Quadropolis gets a (mostly) clean bill of health here – while colours do clash occasionally, the key information is always provided iconographically and the icons are visually distinctive. Everything from supplies, requirements and classification of building is identified directly on the tiles. However, when you look at the tiles close up you can see that the contrast is spectacularly bad for some combination of tiles and conditions. Look at the residential areas for example here – for those with Tritanopia the icon is all but invisible. True, it’s not that big a deal because there is art on the tile as well and that is distinctive regardless of colour blindness. It’s still a shame to see it. 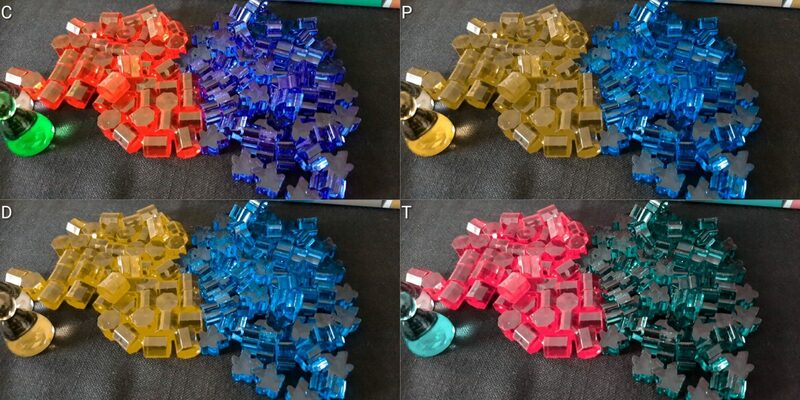 The meeples and barrels can’t be easily mixed up – they’re visually distinctive in terms of their colours, and of radically different form factor in any case. 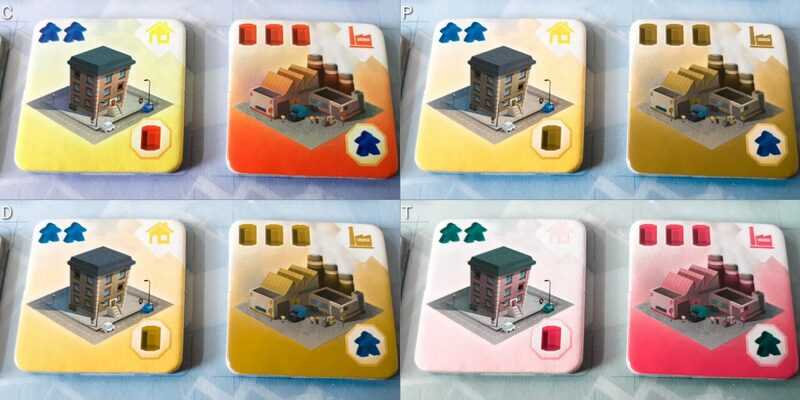 If playing classic mode, a coloured version of the architects is used – this doesn’t impact particularly on the game since this is only used to indicate ownership and carries no other state information. Ownership in itself doesn’t matter once the tile is placed but it will have a small impact on setup unless that is handled by someone without colour blindness or you just don’t care very much about the colours being allocated correctly. As you can see, there are some small problems here and there but they’re not significant enough to detract from the strong recommendation we’ll give Quadropolis in this category. None of the tiles in the game have any way to differentiate themselves other than visually. This is yet another game that is, in our view, fully inaccessible to those with total blindness. As mentioned above, contrast is very poor on some of the tiles but this is offset to a degree by the fact the art is distinctively identifiable. If you’re in the position of being able to make out the icon you’ll be guided more by the prominent art in the centre. Colour is a useful identifier, as is the art, and together they make most of the tiles visually clear. It’s rare that information that is critical is poorly contrasted and ambiguously presented. The setup stage of the game is likely to be an issue though because the back of the tiles indicate the correct player number count at which the tile should be flipped. This is poorly contrasted. You set this board up five times during the game so this isn’t simply a ‘one and done’ problem – this raises its head a few times during play and the process is awkward enough that it really helps if the burden of the task can be shared. This isn’t a critical problem, but one that has an impact on convenience in a game that is already cumbersome to configure. The main game loop is selecting an architect from the selection available (five per player at the start of the round), using that to pinpoint a building within the constraints of placement, and then placing that tile in a location of your city indicated by the number. There’s a lot of visual processing here but it’s almost always within relatively tight constraints. The presence of the Urbanist (a large, chunky pawn that is easy to see or touch) reduces the amount of consideration a player must put into their selection. As time goes by the presence of other architects will reduce the number of decision points to a handful although bear in mind the yard will refresh every round. 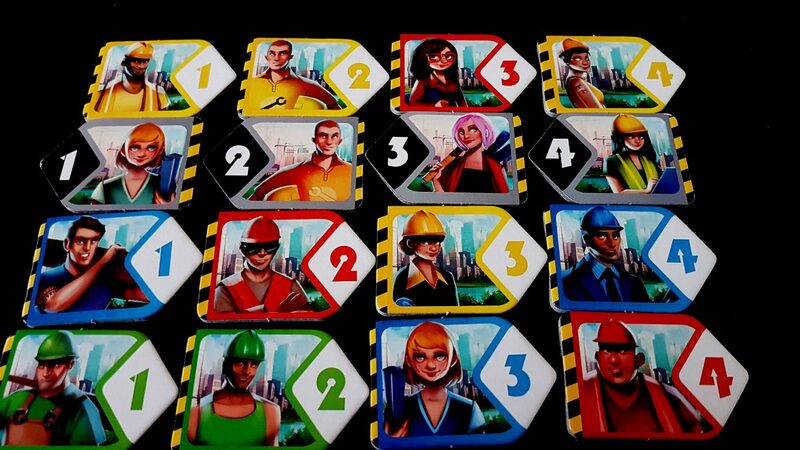 It’s possible for a player to fully interrogate all options available on the construction yard each turn. The problem here though is that Quadropolis is a game of adjacency and evaluation of network effects. The architect you choose will determine where the tile should go, and as such while you’re only choosing from a small number of possible options you have a lot to consider with each. The city you build isn’t simple in terms of its scoring architecture or its activation infrastructure. You need to be balancing people and barrels against consumption and weighing up the cost and benefit of new buildings on that basis. As such it might be necessary for you to think quite far ahead in terms of your placement and that’s always going to be easier when you can see the city you’re building in front of you. There is a tactility associated with play that will influence how much of this information needs to come visually, but there’s a limit to how far that can take you. You’ll know which building are activated, for example, but close inspection (or game familiarity) will be needed to tell what’s actually needed for an activation. The key factor that works in the game’s favour is the relatively tight constraints within which you’ll be operating, and the structured way in which the districts work. They follow a well-defined pattern and a well-defined numbering system. Numbers for districts are defined clockwise from the top left (except for four), with the lot numbers within a district simply skipping the district number but continuing uninterrupted. District 2 for example has 1, 3, 4, and 5 for lot numbers with each following a clockwise orientation. As such, with familiarity the spatial implications of the architects can be reasonably easily mastered. As discussed in the review, the nature of the emergent elements of the scoring mean that there will be a kind of landmark system that emerges anyway which will limit how much a player needs to consider. We’ll offer a tentative recommendation here, but it’s highly contingent on the extent to which you’d feel comfortable holding a map of the city and the construction yard in mind. With support from the table, we think Quadropolis is likely playable with care. 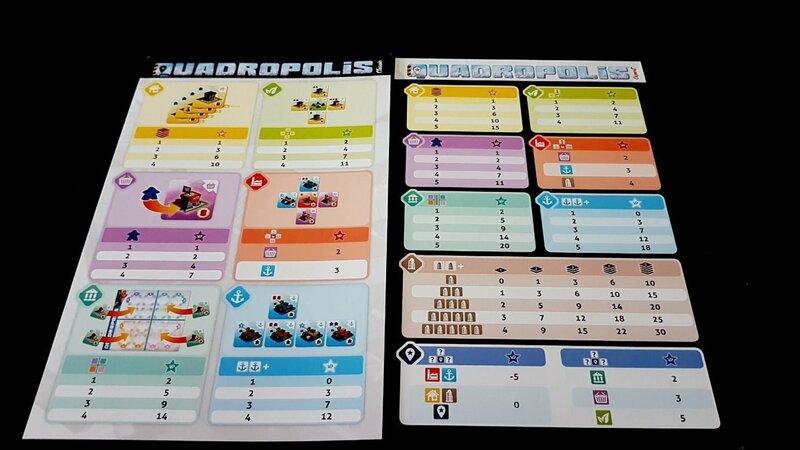 Quadropolis does one of my favourite things here – it gives the equivalent of ‘beginner’ and ‘expert’ rules but doesn’t stigmatise them with those labels. The beginner ruleset is called ‘classic’ mode, and is perfectly enjoyable if a little boring for more experienced players. It removes two of the more complicated buildings, shortens the playing time, simplifies some of the scoring and more tightly constrains the cities. As such, it’s a good baseline from which to consider a cognitively accessible variant of the game. The rules within the classic game are relatively straightforward and were that the only factor we wouldn’t have serious qualms about recommending the game to players with minor to the lower end of moderate cognitive impairments. The mechanism of select a tile, move the urbanist, place the tile – that’s low cognitive impact. Some addition may be required. Or should that be SUM ADDITION. Unfortunately that’s not all there is to it, and the additional requirements for play on top of that are quite intense. This is a heavily numerate game – the hefty score pad it comes with is testament to that. Summing up of scores at the end can certainly be handled by one player on behalf of others. The problem is that you spend a lot of your time in Quadropolis burnishing up the scores you’re accumulating as you play and sometimes explicitly optimising the distribution of resources for maximum end-game impact. That needs an understanding of the numeracy of scoring, and that scoring is complicated. I’ll give you just two examples. Harbours get scored when placed in a line or a column, and that score depends on how many aligned tiles there are. You only score one line and one column. One harbour by itself gets you nothing. Four harbours in a row gets you twelve points. That’s simple enough, but then you need to layer in the fact the value of a harbour space is also moderated by nearby factories – an adjacent harbour will earn a factory three points. So even placing a non-scoring harbour might be worth it if it increases the value of the factory. On top of that, you need to assess the opportunity cost that comes from building large harbours – they’re taking up spaces you might well need elsewhere. Public services on the other hand get scored depending on how well they’ve been distributed throughout the districts. If you have a public service in four districts you’ll get fourteen points. If you have it in one you’ll get two points. If you have four public services in one district you’ll still only get two points. As such placement of other tiles is influenced by how many public services you’re hoping to put into the city, and placement of everything else is influenced by your need to keep the necessary lots free. Every different kind of building has its own rules here, and some of those rules require forward planning, synergistic placement, or knowledge of the adjacency effects associated. Placing a tile might be zero points or it might be six or more. It all depends on where it’s put. You need to understand the scoring context to play well. I mean, just look at the quick reference for the scoring to see how varied it is. Coupled to this we need to consider the puzzle element of the architects themselves. This requires players to route around damage to a certain extent. Each tile has a large number of ways it could be selected, and knowing the correct way to do it depends on what you need later and what your opponents likely need now. You want to use the architects that are otherwise low value to you and high value to your opponent. All of this you need to keep in mind whilst being aware of how the options you’ll have in the future will narrow based on your choice. And of course, the number you end up choosing will determine where the tile ends up going, and that in turn feeds into the scoring implications we discussed earlier. Consider the board above – let’s say you want that central playground. That’s easy – the only way you can get it is with the three architect, and the urbanist that you place after it will stop anyone picking from that row, forcing them to choose a column instead. You won’t block a column for anyone since there won’t be a tile anyone can take. So now you’ve just made the three architect much more valuable for everyone because they can only get that row by going three from the top or bottom. Are you going to need a three later on? You might – so is it a good idea to pick that tile when you could go for one of the parks that would offer fewer restrictions and less contention over the three? That’s a complex decision making process you need to take into account in order to play well, and even just in order to score reasonably. As such, even the classic game as it is presented in the box asks an awful lot of its players. 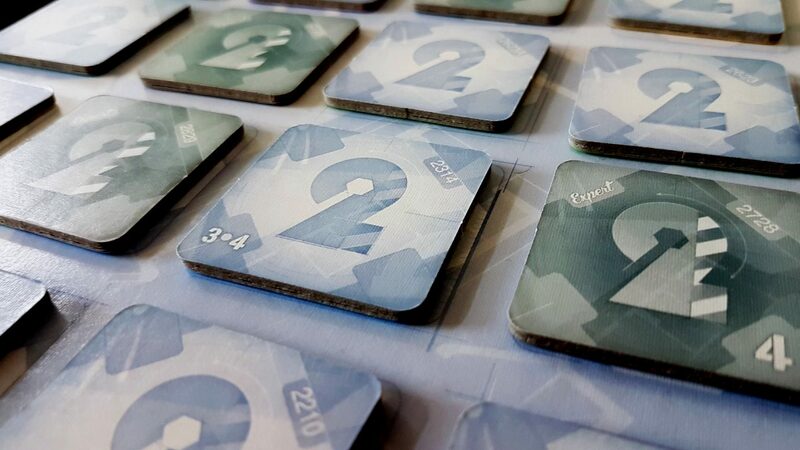 As usual, we can discuss a cognitively accessible variant here – one that revolves around playing tiles but with a much simpler scoring context. Perhaps even one that’s played collaboratively, with everyone trying to make one big city. You could certainly do that but while the act of building a city is satisfying I don’t think that comes from the building itself. It comes from seeing a plan click into place. This isn’t like Carcassonne where you can just happily make a nice landscape. In order for you to derive enjoyment from the harbours it must be because of how they serve your city. This is in the end a puzzle game, and while there is certainly some value to be had in just arranging pieces around a board it’s not meaningfully an experience that captures the essence of the thing. For those with memory considerations, the story is a little more positive – other than the scoring context there isn’t a lot that anyone ever needs to remember other than the flow of a turn. It’s easy to forget to move the Urbanist for example when you’re focused on where a tile is going to go. The manual even recommends you have a designated person responsible for moving the Urbanist if people forget. The problem again comes down to the complexity of the scoring system, and remembering which buildings do what and how they are best leveraged. 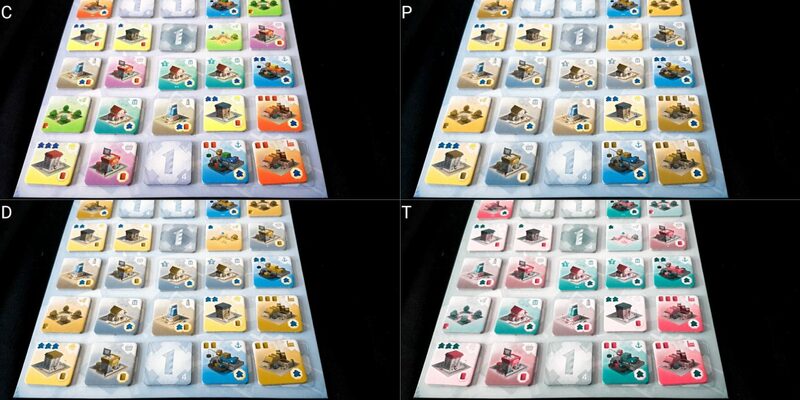 We don’t recommend Quadropolis in either category of cognitive accessibility. You’re often working within quite tight constraints within your player board, especially when dealing with shops that might be holding five meeples and an energy activation token. However, the grids are generously proportioned in terms of space between city elements and fine positioning isn’t strictly required. The player mat you get is frictive cardboard so the tiles don’t tend to slip about too easily. 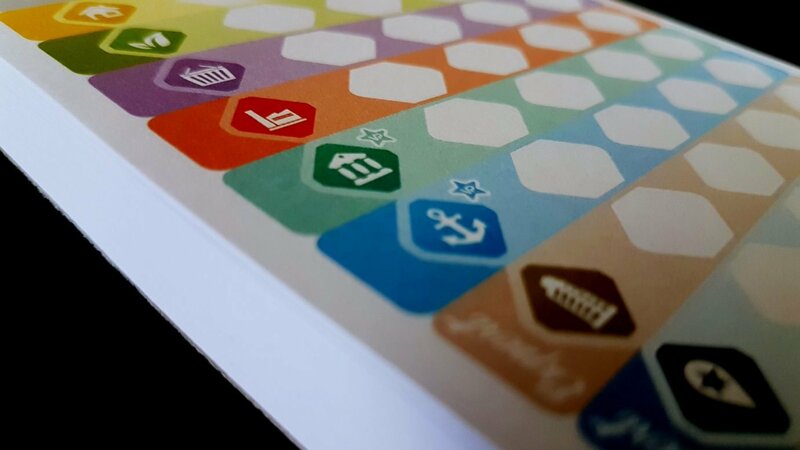 The energy and people tokens are tiny, and you’ll be distributing them fairly regularly around the tiles to remind yourself of your activation plans. You’ll also be stacking some tiles on top of other tiles to indicate multi-storey structures and this can lead to some awkwardness. Nothing though really requires especially careful positioning and really you don’t even need the board other than as an aide memoire. You could lay the components out in front of you in a more comfortable grid without serious game impact. The setup of the game properly makes use of a cloth bag from which the tiles are drawn. Mrs Meeple and I found this more hindrance than help so we just shuffled them up and parceled them out onto the construction yard. Strictly speaking this permits a degree of minor cheating, but not so much that it actually makes a difference even if someone really wants it to. Setup like this happens five times during the course of a game and it’s the most awkward of the physical interactions required. A player without physical impairments can handle all of this but it’s a task that is less of a pain in the arse if more people are helping out. The only other physical interaction is selecting and positioning an architect, and again there isn’t a serious need for this to be done neatly or even particularly accurately as long as intention is clear. Moving the urbanist at this point is something that can be done by the designated urbanist mover. Verbalisation is reasonably straightforward although not explicitly supported by the game. It’s easy to be exhaustive in selection of tiles from the construction yard, because all someone has to do is point the architect at all the possible row and column points until someone says stop. A grid system would have eased this considerably though. Being able to say ‘column a, top’ or ‘row 4, right’ would have simplified this task but there’s nothing to say that individual players couldn’t adopt their own convention to that effect. The architect number will then identify the specific tile, and each player grid does permit unique and unambiguous referencing. ‘District two, lot four’ as an example. We recommend Quadropolis in this category, although bear in mind some compensations will likely be required in certain severe cases. 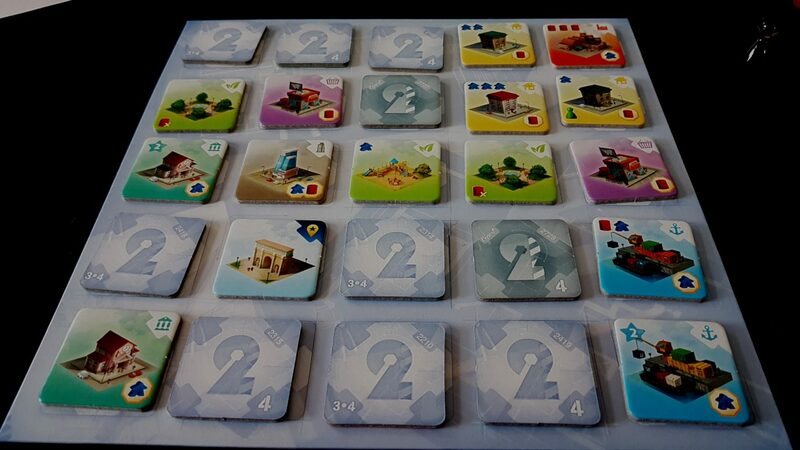 There is sometimes pointed competition in a game of Quadropolis – it is definitely possible for players to undermine each other through the selection of architects or the placement of the Urbanist. Nobody ever gets to directly interfere with your city, but they can severely hamper your opportunity to construct it in the way you want. There’s a very limited supply of each kind of tile in each round, and in a larger game it’s entirely possible that you’ll be prevented from taking any of your preferred classification before your turn comes around. It’s also possible for players to gang up on another by collaboratively locking an opponent out of opportunities. Often in games this is a problem for a runaway leader that pokes their head above the parapet, but in Quadropolis at least identifying a winner is usually too complex a calculation to run a serious, persistent risk. You’ll likely have an idea of who’s doing well in particular kinds of building, but that doesn’t necessarily translate into knowledge of who’s currently winning. Score disparities can be quite intense as a result of this – that’s inevitable in a game that’s all about balancing income versus outgoing and then maximising score with fine positioning. If the difference between a tile scoring zero and scoring twelve is whether it goes in exactly the right location, then it can be frustrating to be denied the ability to make it happen and absolutely devastating for your score if you can’t. Coupled to this is the fact that placement is permanent – if you’re left with a monument that is negatively scoring, you’re stuck with it to the end. You might want to bulldoze it away to connect up your harbours and recover your score, but you can’t. You live with the consequences of your previous choices with every future decision. It’s possible to feel very clever in Quadropolis when you manage to set up a combo that simultaneously gets you exactly what you want while denying any advantage to your opponent. The counterpoint there is that it’s possible to feel very stupid if you can’t accomplish any of the scoring goals. Quadropolis is first and foremost a puzzle game, and puzzles are supposed to be solved. That won’t always be possible here because other people are incentivised to make things difficult for you – that can be a trigger for emotional control issues. None of these are critical problems though and by and large the game offers enough opportunities that you never truly embarrass yourself with an end-game score unless through stubbornness you refuse to shift your strategy. Someone blocking you from harbours means you’ll likely get a free run at shops and tower blocks. Someone gobbling up all the public services probably means the office buildings are free. 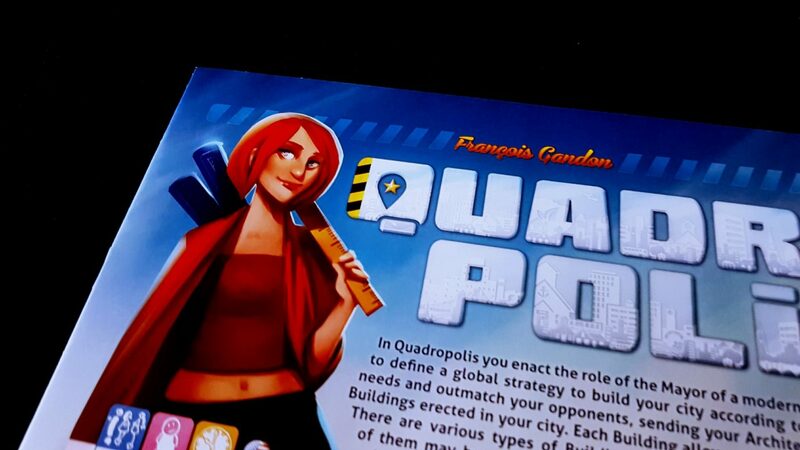 While you can do badly in a game of Quadropolis, it’s rarely because you didn’t have any options. We recommend Quadropolis in this category. I would have liked to have seen some more ethnic diversity in the roster of characters but in terms of the gender balance and emphasis of role across the architects it’s hard to fault Quadropolis. The cover shows two women and a man on the front, with various men and women depicted elsewhere around the box. 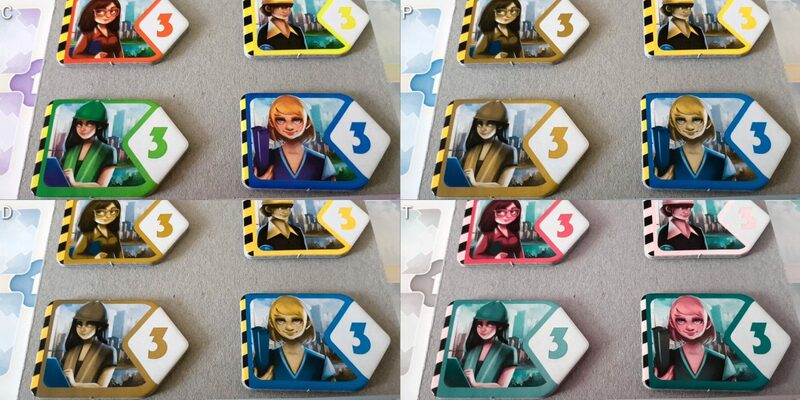 It’s important here to note that this is even better than just in terms of numbers – the women throughout Quadropolis are shown in the same positions of power and authority as the men, and that’s superb. However, as I say it would have been nice to see a few more nationalities and skin colours represented across the set. At best, you can say that there are some architects that under a certain light look like they might be an attempt to broaden the diversity of the characters. If that’s what’s intended, it’s a good deal more tentative than I would like. What’s here is good, don’t get me wrong – it’s just that it’s obvious an effort was made, and that effort fell short of being as inclusive as it could be. I would have liked to have been unabashedly congratulatory here. The expansion, as best I can tell from the art I’ve seen, does an even better job on this score. I don’t have it to say for sure though. As you might expect from the careful attempt to have a good gender balance, the manual doesn’t default to masculinity and the art doesn’t sexualise or objectify any of the architects. The closest it gets is an architect with a midriff shirt of the kind that any number of people wear in real life. In terms of its price, Quadropolis has an RRP of around £38 and it has a hard ceiling of four players. It won’t scale up to larger family nights, but it will accommodate nicely its full range of supported players. It plays well at two, well at three, and well at four. As such, even if you can’t necessarily get even a moderately large family around the board you’ll have no difficulty in getting it to the table for smaller arrangements. The price might seem on the high side in terms of ‘price per player’ but you don’t wonder where your money went and it’s good enough to see regular rotation in anyone’s gaming library. We strongly recommend Quadropolis in this category. There is no requirement for communication during play, and no need for literacy – all the game components make use of iconography or symbolism to explain their impact. Muttered curse-words as someone takes the tile that they know you want are entirely optional. The combination of colour blindness and other forms of visual impairment is going to have a powerfully detrimental impact on playability. As such we’d retract our recommendation for both categories. We already don’t recommend Quadropolis for anyone with cognitive accessibility issues but this would become even more strident should these intersect with visual impairment. The need to hold a mental map of your city and the construction yard is critical to effective play for those that cannot visually process the game state. Quadropolis takes between thirty and sixty minutes to play, barring accessibility considerations, but I suspect that is optimistic when considering the issues relevant to these teardowns. The punctuated setup which takes place at the start of each round by itself is likely to add new time costs for everyone as the shifting context of play is re-evaluated. Luckily though it plays briskly aside from that, and turns tend to be rapid – this means that there’s unlikely to be a need to worry about issues of attention or impatience. The downside to that is that the game rounds don’t incorporate any serious moments of disengagement – by and large you’re involved through the round and there aren’t opportunities to take a small moment’s respite without the consent of the table. Here though the awkwardness of the round setup does offer some breathing room. It’s just found in-between and not within the round structures. That said, nothing in Quadropolis is especially intense or demanding. The decisions you make are interesting but they tend to naturally filter down into a few sensible options as your city takes shape and other players start looting the construction yard. I don’t foresee Quadropolis having a serious impact on discomfort or distress. In any case, while individual rounds don’t offer a way to adapt to a reduced player count, the game itself can smoothly support it by simply reducing the number of architects available in future rounds. 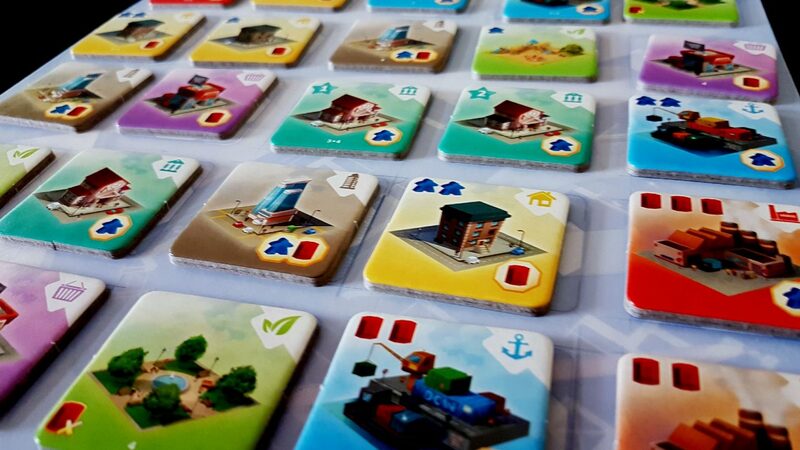 Tiles collected by a player no longer in the game don’t need to be redistributed – the yard is refreshed through other mechanisms throughout play. As long as someone can make it to the end of the round, even simply playing randomly, they need not worry about being in the game for the long haul if they need to excuse themselves. Quadropolis is a great game, and while we wouldn’t recommend it to anyone with cognitive impairments (and would be tentative in our recommendation for people with visual impairments) it actually comes out of this teardown rather well all things considered. 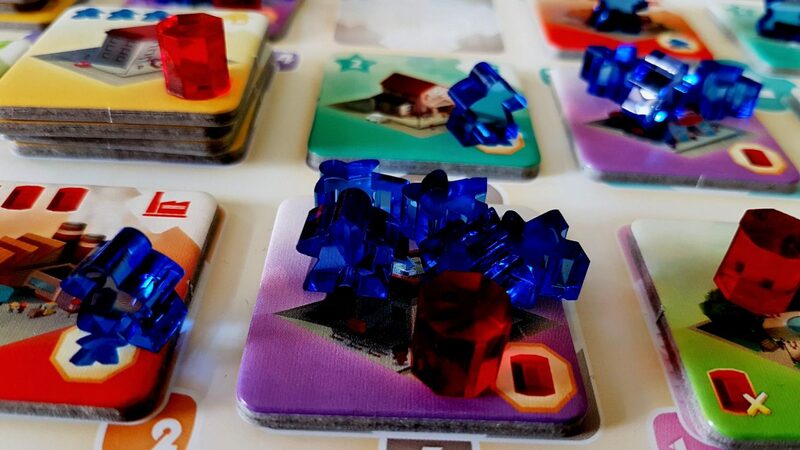 The cognitive elements of the game just don’t lend themselves well to obvious accessibility fixes – too much of it is bound up into the puzzle of the scoring, and that’s really what Quadropolis brings to the table. To focus too much on the tile laying of city elements at the expense of scoring is to lose that which is integral to the experience. Not every game is going to be a candidate for full accessibility to everyone and this is an example of a game that that simply asks a lot of its players. Those that can meet the demand will enjoy it, but lowering the demand would mean no-one would enjoy it. This is sometimes the danger in game design – we can’t lose sight of the fact that sometimes the inaccessiblility is where you’ll actually find the fun. We liked Quadropolis enough to give it four stars, and it sits happily on our shelf with no serious risk to its inclusion. While we can’t recommend it to everyone, we certainly recommend it to anyone that thinks they can get the most out of the experience. Now excuse me, I can see some daylight filtering through the people I’ve shoved into this shop. There’s room for a couple more if I push really, really hard.